Baseball Cards! Football Cards! Hockey Cards! 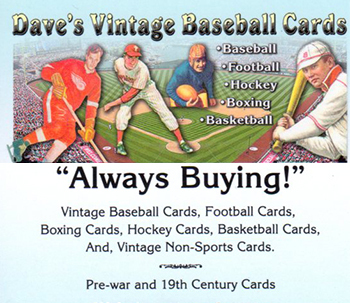 Welcome to Dave's Vintage Baseball Cards. You will find a full selection of baseball cards from the 19th Century right up through the 1970's Featuring Topps, Bowman, Fleer and insert and Oddball Issues as well. Some of the interesting issues You will also find are Food & Regional issues, Pacific Coast League, Venezuelan and Canadian to name a few! You will find Pre WWII cards and Tobacco, Caramel cards too. We also carry a huge selection of Football, Hockey, Basketball, Golf, Boxing, Wrestling, Billiards, Track & Field as well as Non-Sports cards too! There is nothing like re-visiting our childhood interests and here at Dave's we have a saying: "You're never too old for a happy childhood at Dave's Vintage Baseball Cards!" 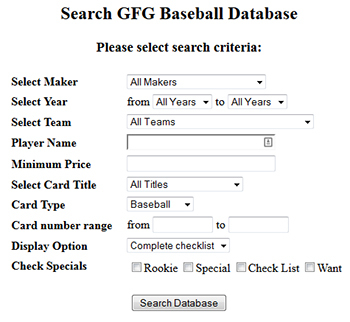 Search by Player, Team, Sport etc. Use this Banner link to access our entire Baseball Section. Scroll down for all other sections. when we have sales and great new acquisions! 1947 series EXHIBITS to 1966. 1970 'S COMPLETE CARD LISTINGS!! Lists non-sports sets and cards! Copyright © 1997 all rights reserved ! to Copyright © 2015 all rights reserved !